Tracker Suite simplifies project and portfolio management for organizations. Our Tracker Suite software offers organizations the opportunity to facilitate all the best practices of project management, ensuring that their teams have ready access to the tools and information they need to work effectively. Using Tracker Suite, organizations can manage projects online, track their project portfolios and manage project programs. Tracker Suite helps organizations deliver projects on-time, on-budget by simplifying workflow and providing tools for organizational and individual planning, scheduling, budgeting, status reports, on-line documentation and process implementation. Project Tracker, our base module for PPM solutions, integrates with Microsoft Project, supporting the import and export of Microsoft Project files. Our Project Office (PMO) software solution helps your organization's Project Office to manage its portfolio more effectively and reduce costs, by providing tools, reports and functions that simplify the tracking, scheduling and management of work and resources. Implementing a PMO solution can increase the number of projects completed on-time and on-budget, and ensure that resources are neither overloaded nor under-utilized within the organization. And Tracker Suite can provide a single, online portal for all your Project Portfolio Management needs. Through our combination of select and integrated modules, our software solutions gather, combine and utilize the data it needs for true business intelligence. With Personnel Tracker, it facilitates resource management, with resource calendars and capacity planning, improves communication, and team development. In conjunction with Time Tracker and Purchase Tracker it manages budget vs. actual by line-item for projects, tasks and account codes, improving project job costing as well as streamlining and securing these processes with features including automated approval routing and electronic signatures. 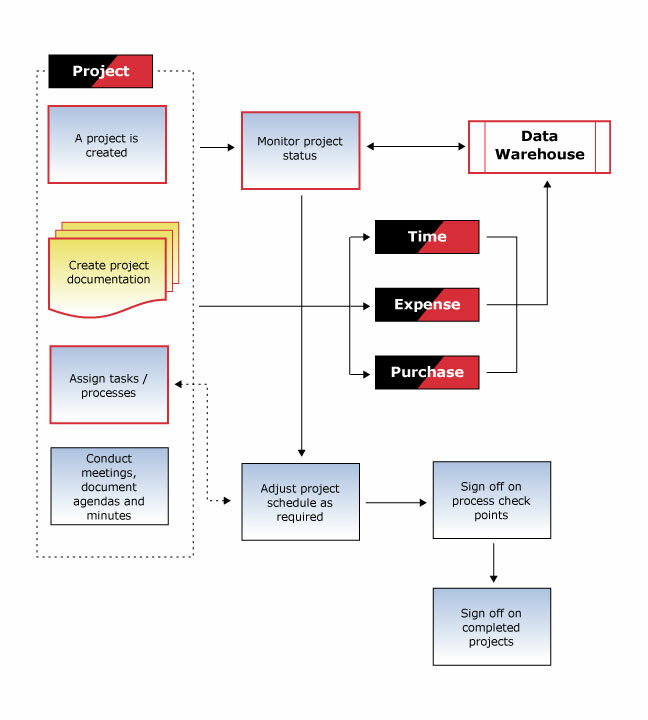 Project Tracker pushes data to the Tracker Data Warehouse, a Web based reporting engine, which generates reports that managers and executives can leverage for important decisions, including Budget vs. Actual, Project Trends, Project Portfolios, Earned Value and more.